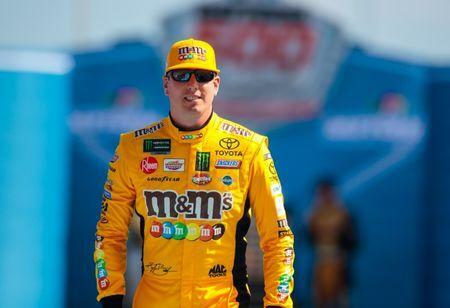 MARTINSVILLE, Va. -- A week after locking up his 200th NASCAR national series victory at Auto Club Speedway in Fontana, Calif., Kyle Busch took the first step toward the next century mark. Holding off challenges from Ross Chastain and runner-up Ben Rhodes, Busch survived a late restart in winning Saturday's TruNorth Global 250 NASCAR Gander Outdoors Truck Series race at Martinsville Speedway. The race ended under a last-lap caution, after Reid Wilson's No. 44 Chevrolet spun in Turn 4 and nosed toward the inside wall. Rhodes was running second when the yellow flag waved, with reigning series champion Brett Moffitt third and Chastain fourth. The victory was Busch's second at the .526-mile short track in his own Kyle Busch Motorsports Toyota. Busch has won each of his three starts this season and now has 54 victories in Trucks, extending his series record. "All these guys kept trying to make it turn the center (of the corner) better. At Martinsville, you have to turn the center without getting too loose in or too loose off. ... And we had enough tire at the end to hold them all off." "Today we just kind of let the race play out and come to us," Busch said. "It was a good day at Martinsville," Rhodes conceded. "It was the best finish I've had here yet. I was surprised -- qualifying 16th. We had a fast Ford F150, but we just needed a little more. We got beat by the best in the business. He knows what he's doing here. "It was fun following him and seeing how he was pacing himself. That's something I've struggled with in the past... Anytime you restart next to that guy, I try to log it in my memory banks so I can just try and get him next time."